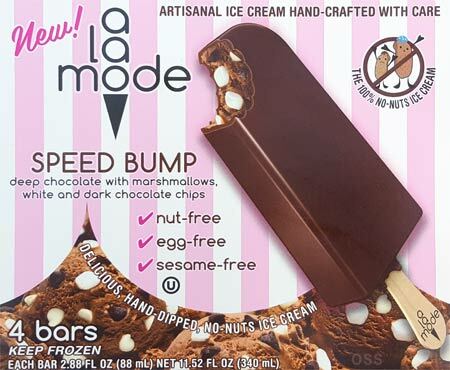 Dear Reader, shortly after posting this review, a la mode contacted me to let me know that at some point something terrible had befallen the box of speed bump bars shown in this review. They immediately sent over fresh samples of all of their new 2017 products and I have to say, the fresh Speed Bump bar was delicious. I am now thoroughly convinced that my local Shaws let my bars completely melt and then were refrozen. 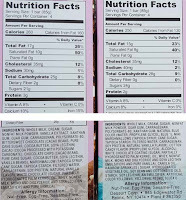 For proof, just look at the last picture and notice that all the mix-ins sank in the bar rather than being spread out like the fresh bar I just ate. For the sake of honesty, I am leaving up the original review, but rather than use it as a knock against a la mode, please use it as a reminder that there is no guarantee that the product you buy has had an easy life. 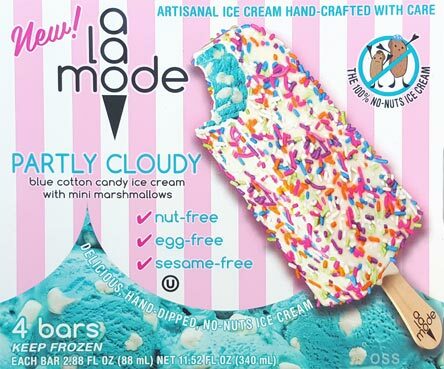 Kudos to a la mode for standing behind their product! [New for 2017] Who's ready for another nut-free, egg-free, sesame-free treat? I was originally going to break this review in two but let's keep these new bars together. I tried speed bump first and while the dark-chocolate-ish shell is pretty good, the insides are much more pudding pop than ice cream. Actually, the inner texture is distractingly bad. I guess maybe it could have refrozen at some point, but it's not good. The weird thing is that the textures of these two don't match. 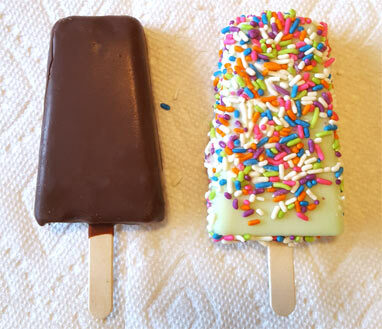 Look how different the texture is! 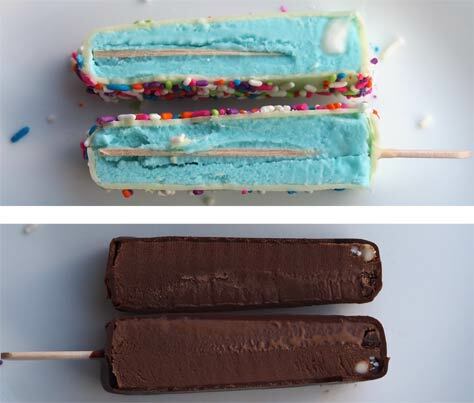 On top of a better inner texture, PC brings a #funfactor with actual sprinkles all over the outside of the bar. Yes, some fell out in to the wrapper but who cares. I take a few bites and the bar almost has the texture of the sugar dipped anise cookies my mom makes. Sprinkle texture + coating texture + ice cream texture gives this one a very different feel than the chocolate variation. The PC bar also bring a legit cotton candy flavor. It's not super strong (and thankfully not super sweet), but it's definitely cotton candy and that flavor goes well with their unique texture. I would suggest picking these up if you like cotton candy and want an ice cream bar that's fairly different. One more thing: don't grab these thinking the insides are going to look like packaging. My first serving was minimal on the marshmallows and this second set I cut up here had just three marshmallows in Partly Cloudy and two in speed bump. Speed Bump also had 8 tiny chocolate chips and 5 tiny white chocolate chips that had gathered at the "top" of the bar (which would be the bottom of the bar when it was made). That's it, turbo review over! Speed bump is not worth your money for any reason and Partly Cloud is worth a try if you dig cotton candy stuff. Would you search either out? Neither appeals to me because I have no allergies so I prefer the real thing. However, I’d definitely buy the PC for an egg allergic child who is a guest at my home regularly. It’s a very pretty bar. 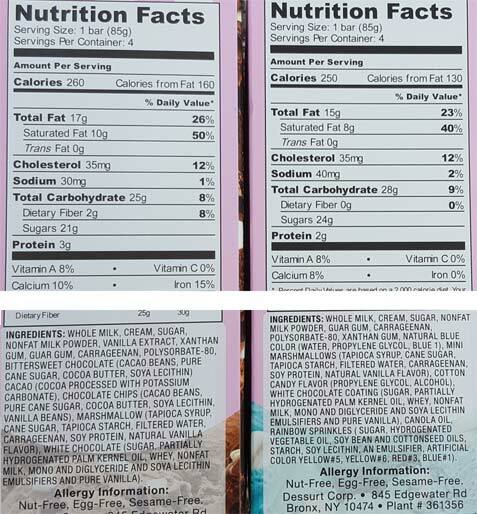 Do either of these bars actually have mini marshmallows in them? It's unclear from the photo. Might pick up a box for my nieces over thanksgiving. It looks like good pick to avoid most allergy problems and they'll get a kick out of the sprinkles. I'd go for the sprinkles, at least! @Anon: "real thing" may not be the best term here. This is real ice cream in every sense of the word, they are just more careful about what is in their factory. Its really refreshing to hear about such great customer service like that. Stinks the first batch was damaged, though. Can you bring your receipt back to Shaw's, or do you think you'll just drop it? It's already been replaced and then some with samples of their other products, so nope, I wouldn't try to get my money back as well. In almost a decade of blogging, I think my return count stands at one (mr. green pint returned to stop & shop several months ago)... maybe two?